The Seattle Mariners are undoubtedly on the short list of the most disappointing teams in baseball over the first month of the season. 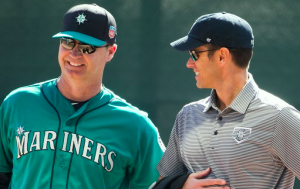 In a little more than 18 months on the job, Mariners GM Jerry Dipoto has transformed the team’s roster through an endless series of trades, creating great excitement and expectations heading into the season. However, at the end of April, the Mariners were 11-15 and now find themselves tied for last place in the AL West. But despite the slow start, Dipoto and the Mariners are showing no signs of panic. Dipoto cites the team’s difficult schedule and unfortunate series of injuries as two reasons why Seattle has struggled out of the gate. The Mariners played more road games than any other team in baseball in April with 17, and 13 of those games came against teams with winning records, including seven games against division leaders like the Astros and Indians. That schedule doesn’t necessarily excuse a 5-12 road record, but it does indicate that the schedule should get a little easier in May. On the injury front, key offseason acquisition Drew Smyly has been sidelined all season because of an elbow injury. The same is true for key relievers Shae Simmons and Steve Cishek. Also, last week, the Mariners lost ace Felix Hernandez and right fielder Mitch Haniger to the DL. Not only are the Mariners coping the loss of two of their most talented starting pitchers, but prior to his injury, Haniger was the team’s most productive offensive player, creating a void in their lineup. Dipoto also cites a lack of production from several position as reason for the team’s struggles. The Mariners have already cut Leonys Martin in hopes of getting more production from their outfield, and the loss of Haniger obviously doesn’t help. Seattle is also getting nothing offensively from the catcher position, as both Mike Zunino and Carlos Ruiz are hitting under .200. First base has also produced little for the Mariners, as Danny Valencia has struggled and Dan Vogelbach is yet to get going after being recalled last week. “At first base and catcher, it’s been a difficult time for all the bodies,” said Dipoto. Nevertheless, Dipoto isn’t worried about Seattle’s place in the standings. Considering the team’s schedule, rash of injuries, and well below average production from several positions, Dipoto isn’t all that upset about Seattle’s record. In fact, the Mariners are in decent shape considering everything that has gone wrong for them and are a bit fortunate not to be further back in the standings. On paper, the Mariners look far more talented than a team that went 11-15 in April, and so, Dipoto is right to not overreact to the slow start. Of course, that doesn’t mean the Mariners can continue to falter and fall further behind in the AL West. The Astros look tough to beat, and none of the other teams in the AL West are likely to rollover this year, and so the division is likely to remain tight and competitive all season. Dipoto and the Mariners don’t need to panic right now, but they also need to get things moving in the right direction as soon as possible.